Wherever she has been for the past two decades, from Hilton Head Island to South Florida to Maui, Amber Kuehn has been devoted to saving sea turtles. But never has the head of the Hilton Head Island Sea Turtle Protection Project seen more commitment from the community to help her cause. From the growing group of “Turtle Trackers” advocating up and down Hilton Head Island’s beachfront to the push from local environmentalist groups to ban plastic bags and reduce the use of plastic straws, Kuehn is feeling the shared love for her reptilian friends. 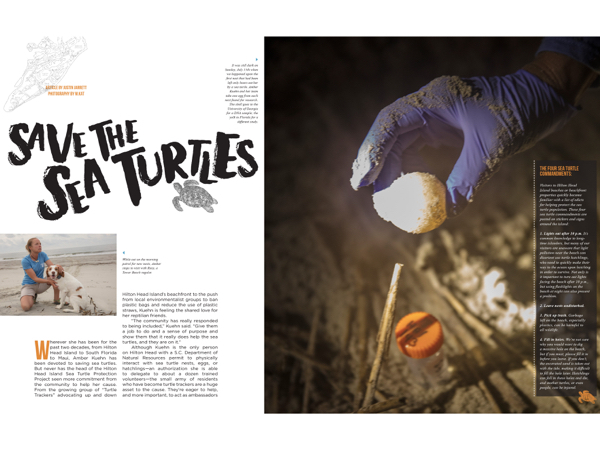 Although Kuehn is the only person on Hilton Head with a S.C. Department of Natural Resources permit to physically interact with sea turtle nests, eggs, or hatchlings—an authorization she is able to delegate to about a dozen trained volunteers—the small army of residents who have become turtle trackers are a huge asset to the cause. 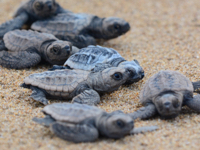 They’re eager to help, and more important, to act as ambassadors on behalf of the program and the turtles it seeks to protect. That means spending lots of time on the beach, which isn’t a bad way to volunteer one’s time. Turtle Trackers patrol the beaches to fill in holes left by beachgoers, pick up trash, and talk to visitors about why it’s important that they follow certain guidelines to help the turtles avoid harm. “The beachfront community Turtle Trackers have become very helpful,” Kuehn said. The holes have become a major problem of late and not just for turtles, she explained. Beachgoers often dig deep holes and leave without replacing the excavated sand, which is then washed away by the tide. The result is a massive cavity, sometimes as large as four feet deep and six feet wide. Hatchlings can fall into these chasms and die, and mother turtles—or even people—can be injured when they stumble upon the holes. In fact, the group is seeking a town ordinance to prohibit large shovels with metal spades, able to dig holes on the beach beyond what one might do with the traditional small plastic shovel and pail. All of this is especially important now because of an anticipated dip in the number of nests on local beaches due to a harsh winter that killed much of the food source for loggerheads. Under similar conditions in 2014, Kuehn said there was a 62 percent drop in the number of nests, and current trends project a similar dip this year. It’s not all bad news, though: Mitchelville Beach and Pine Island each had three nests by early July, which is ahead of their usual numbers, and one green sea turtle nest has been located—just the third one on Hilton Head Island in 30 years. Kuehn also is encouraged by legislation to ban single-use plastic bags throughout Beaufort County, which goes into effect Oct. 14, and a recent push to reduce the use of plastic straws. The more residents understand the importance of protecting marine life and share that knowledge with guests, the easier Kuehn’s job becomes. In order to continue that education process, Kuehn takes advantage of every opportunity to speak to groups such as schools or clubs, and even takes her “sea turtle ambulance” on the road for outdoor presentations so people can see the realities of her work. “When people get to experience what it’s all about, they start to feel a connection with the program and want to support us,” she said. 1. Lights out after 10 p.m. It’s common knowledge to long-time islanders, but many of our visitors are unaware that light pollution near the beach can disorient sea turtle hatchlings, who need to quickly make their way to the ocean upon hatching in order to survive. Not only is it important to turn out lights facing the beach after 10 p.m., but using flashlights on the beach at night can also present a problem. 3. Pick up trash. Garbage left on the beach, especially plastics, can be harmful to all wildlife. 4. Fill in holes. We’re not sure why you would want to dig a massive hole on the beach, but if you must, please fill it in before you leave. If you don’t, the excavated sand is taken out with the tide, making it difficult to fill the hole later. Hatchlings can fall in these holes and die, and mother turtles, or even people, can be injured. • Bring your own bags. A single-use plastic bag ban goes into effect Oct. 14 in Beaufort County, but don’t wait until then to eliminate this danger to marine life from your footprint. Bring your own canvas bags when shopping to help keep plastic out of our waterways. • Skip the straw. Local environmental groups are making headway in convincing restaurants to reduce their use of plastic straws, and you can help by skipping the straw when dining out or by using stainless steel, reusable straws. 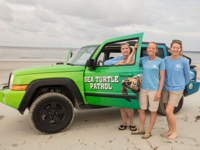 • Donate to the cause: The Hilton Head Island Sea Turtle Protection Project is a 501c3 non-profit, operated entirely by volunteers, so it relies on donations to cover costs. If you would like to contribute, send donations to P.O. Box 23434, Hilton Head Island, SC, 29925.